St. Paul - Minneapolis Bartending School - The Minnesota School of Bartending has been training Twin Cities bartenders since 1968! The Minnesota School of Bartending has been successfully training and placing bartenders in the Twin Cities since 1968. Our experience training successful bartenders has earned us our great reputation. We teach students individually, not in groups or classes. This way we can give each student the personal instruction necessary to be a success. Bartending is a well paying vocation. Bartending is one of the very few careers that allow you to work around your schedule. It is comforting to know that should you suddenly find yourself short of cash, unemployed, or moving to another state (or country), you can always bank on bartending. Bartending is also a great networking job. Don't expect to learn bartending from a book, video, or on-line course. Let the professionals at Minnesota School of Bartending prepare you for the exciting world of bartending. 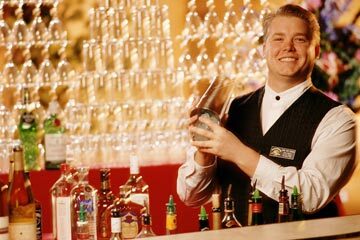 Lifetime job placement assistance throughout the U.S.
We are the #1 placement service for the bartending jobs in the upper midwest...Our graduates are chosen, full and part-time, by the finest hotels, nightclubs, sports bars, cocktail lounges, resorts, and golf clubs.